Filtration in the Oil and Gas Industry can cover a wide range of applications. There are filtration systems for pipeline flow, dehydration systems, wellhead filters, process filters, large volume filters and small volume knock out filters. There are various applications and thus there are many manufacturers that supply filtration in one form or another to the Oil, Gas, Petrochemical and Industrial Industries. 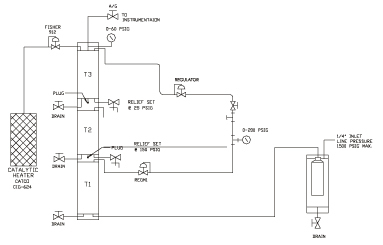 One of the critical areas for filtration in the industry is in the area of instrumentation. Many of the instruments that control processes or equipment use either instrument air or the natural gas itself, to power the instrument. It is therefore very important that the gas be clean and dry in order to provide an uninterrupted supply for instrumentation. Dirty air or wet gas will clog many of the pneumatic controllers equipped with scratch valves and wet air or gas will freeze in the cold winter months. Either of these cases will cause shutdowns or interruptions in service and can become nightmares for operations personnel that are trying to keep services up and running. Filtration for the instrumentation part of the industry can be simple or complex in nature. Most filters or filter systems for instrumentation are designed with ¼ inch NPT or ½ inch NPT connections. They are small volume sizes with low to moderate flow rates (2 scfm to 80 scfm). Since most of them will be used on natural gas systems, they are normally rated for 1440 psi working pressure (ANSI 600), but some may be rated to lower working pressures and some special units may be rated as high as 5,000 or 10,000 psi. They are equipped with an inlet and outlet port and a drain port. Listed here are several variations of filtration equipment that can be found in use today. For simple filtration on non-critical installations you can use hydrophobic linear polyethylene style filter element with a rating of 10 to 35 micron filtration. These will repel most liquids and filter out larger particles. They should be used where minute filtration is not required and freezing conditions are not likely to occur. Certain applications may require the use of a very fine mesh Stainless Steel screen element, due to high temperature or corrosive gas. The Stainless Steel versions can also be used to filter small amounts of liquid, e.g. a chemical injection pump or an Odorant system. The filter bodies are designed for easy removal and replacement of the element. The body can be constructed of Carbon Steel, Aluminum, or Stainless Steel. The typical body volume is approximately 100-cc capacity. The most common use for this type filter is the instrument air supply to diaphragm or piston style pumps, small pilot operated regulators and similar non-sensitive applications needing a reasonably clean instrument supply. For instrumentation systems that are extremely critical to the operations of a pipeline or plant, a dehydration system for instrumentation is frequently the difference between staying on line in adverse conditions or failure. An instrumentation dehydration system consists of two filter dryers mounted together with dual instrument regulation on the package. If one side of the assembly should freeze off, the other side will take over the instrument supply until the first side has thawed out. The regulators are set within 5 psi of each other, and therefore, one will dominate the other in normal conditions. In winter conditions, this is the safest security available for continuous instrument supplies. These systems are generally supplied with Silica Gel and Charcoal as the media in the canisters. In cases of potentially extreme wet gas, these systems can be equipped with an automatic liquid dump, which will act as a liquid coalescer and automatically dump the collected liquid. The remainder of the gas will pass through the dehydration assembly and be dried and filtered for the instrument supply. This set up will be for extreme locations where free liquids are in abundance and the filter dryer alone would have a drastically shortened life span due to the liquid carryover from the pipeline gas supply. The uses for this system would be for pneumatic controllers, platform instrumentation systems, cold climate instrument supply systems and any service where uninterrupted supply is critical. The packages can be supplied with various materials of construction from carbon steel to exotic materials, designed to meet the requirements of the installation. In today’s demanding gas industry, multi-pressure, clean, filtered and heated instrument supply systems are being requested for pneumatic instrumentation packages. These systems are designed to provide multiple separate pressure-regulated volume chambers, a catalytic heat source to reduce cold climate effects, dehydration and filtration and all hook up connections in a single stand-alone package. They can also include pneumatic controllers ready to operate control valves or other process control instrumentation. These systems can be supplied in various materials of construction, ¼ inch and ½ inch NPT connections. Standard design pressure rating of 1440 psi (600 ANSI) or higher pressures if desired. They provide a single source of multiple regulated instrument supply needs. They can be used as a stand-alone system or incorporated into complete control packages. Typical uses are for pressure regulator stations, chemical injection instrument supply systems, process control panels and other similar installations. The analysis market uses a number of various filters to protect the laboratory analytical devices such as the Gas Chromatograph. Whether it is particulate filters to keep small particles out of the equipment, e.g., the need for 2-micron filtration, or to keep liquids from entering the system, e.g., the need for membrane type filters, the industry has a need for a variety of small filtration systems. Glycol removal through the use of shredded PTFE is also a much used filtration product. The design of these filters is important, so that they do not alter the analysis of the product entering the GC. The gas sample enters the housing and flows through the Membrane, effectively eliminating any free liquids from entering the analyzer columns. Mounted horizontally, liquid droplets or slugs drop off of the membrane and drain out through the bottom valve. The design of the various laboratory filters includes unique Millipore filter elements, sintered filter elements, membrane elements and swirl designs for product movement within the filter. These filters are available in a variety of materials of construction and a large variety of internal elements. They are all considered to be small volume and low flow rate filters, designed for analytical systems and the low volume associated with these systems. Connections range from 1/8 inch NPT through ½ inch NPT. The average internal volume of these filters is less than 25cc. Typical applications for these types of filters are in spot sampling practices in the gas pipeline industry and in laboratory transfer from sample cylinders to GC’s. Also, many online GC installations use and require such similar filtration systems to prevent the GC from becoming flooded or contaminated, and thus having to be overhauled. Again, it is important to point out, that the filtration ahead of the GC must be designed so that it does not alter the result, but protects the equipment. Standard filtration will not fit the need of the analytical industry. Analyzer Liquid Shutoff from Welker Engineering, prevents liquid of any kind from entering gas chromatographs, keeping analyzer columns safe from damage. This brief overview of instrument filtration will help make the buyer and designer aware that there products available and manufacturers with the experience and expertise to meet the needs of the Oil, Gas and Petrochemical Industry when it comes to Instrument Supply Filtration Systems. Welker Engineering Company is a designer and manufacturer of this type filtration, with over 40 years of experience and a worldwide reputation for innovative filtration equipment and solutions.